Services - McNeil Consulting Inc.
We work collaboratively with you and your design team to deliver a meeting packed with participation. A meeting that will engage your participants in every session. Our facilitation highlights you, your speakers, and your content. We have refined our craft over 30 years and hundreds of meetings – large and small. When necessary we also can design on the spot – to make sure that something that’s come up gets worked the way you want it to be discussed. Meetings are expensive. Assembling leaders from different places for a large face to face experience is one of the best ways to achieve alignment. We guarantee your significant investment of time and energy pays off. We identify your outcomes and work with you to design and facilitate the planning and the execution of your meeting. 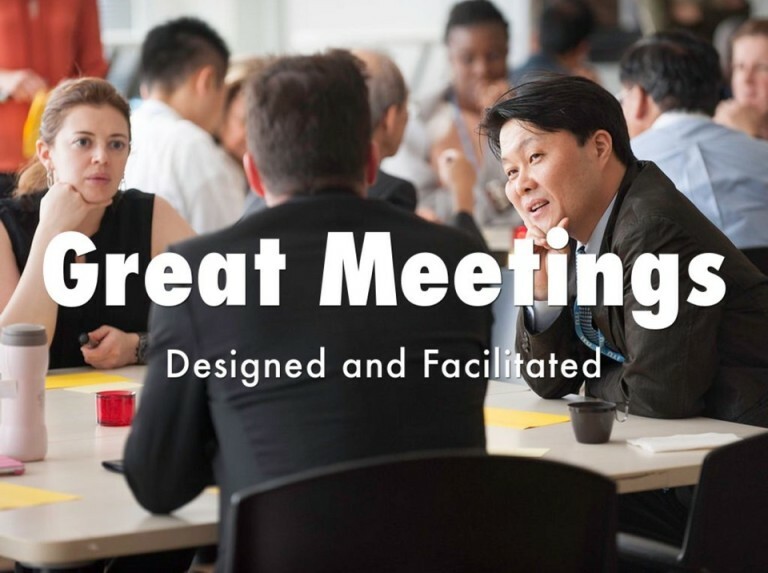 We specialize in full participation meetings where “Everyone has a voice and every voice counts.” One of the great benefits for you is that you can attend your own meeting and not have to worry about leading, designing, and facilitating. We do all the work up front so that at the meeting you can lead with confidence. We will work with you to set up the best environment for your meeting. We will help you choose meeting activities that support your critical content and fully engage your audience in conversations that matter. We can offer meeting and decision support tools that enable participants to brainstorm, prioritize, align, and commit. When you are finished, we can give you a complete summary of each of the activities and the results your team achieved. We design every meeting and we partner with you to make sure you achieve your outcomes and every attendee’s experience is unique, valuable, and memorable. We provide customized ongoing consultation opportunities to work with us. We will structure a retainer relationship to assist you in designing and driving critical organization development interventions throughout the organization. We will provide the expertise you need. We focus on culture assessment, strategy development and execution, team building, meeting design, and facilitation, leading change, and executive development. You will also receive extensive training and coaching in the tools and methodologies of Action Learning and Action Research as we assist in your organizational needs. You are designing a strategic off-site, and you want to get input from the attendees on critical things to cover. You contact us and ask us to develop an online survey tool that can be sent out ahead of the meeting to all the leaders who will be attending. We send out a page from your online collaborative web tool called The Hive and collect the data. As the data comes in you can decide what topics you want to include and where to place the emphasis at your upcoming meeting. At the strategic meeting, you decide to prioritize a list of critical initiatives. You contact us to design a top rank session for tomorrow’s discussion. At the meeting, you open up The Hive page and have the team rank the initiatives. They discuss the findings and create actions against the top three. Design Thinking Sessions – Rob works with you as a partner in collecting qualitative research, organizing the finding, publishing the results, facilitating brainstorming sessions, prioritizing the best ideas, creating prototypes, and monitoring progress. An employee gets promoted to a leadership position, and you want to design a “New Leader Assimilation” meeting. You put your thoughts together and then discuss your design with Rob. You decide to send out a SWOT analysis of the department that can be completed ahead of time by the team members and opened together at the meeting. Rob designs the SWOT and sends it out to all the team’s members. At the meeting, you facilitate a discussion of the SWOT and help the team create actions that line up with their strategy based upon a meeting design that we create for you. One of the leaders asks for executive coaching. You assign Rob to meet with the leader and assess his or her developmental needs. Rob schedules a coaching session, takes a history and does an initial assessment of communication styles and work preferences. You work with Rob to set up a developmental plan that builds his or her skills in the areas identified. Rob works with the leader for a number of sessions to develop and practice the new skills and receive feedback from you, peers and direct reports. Rob is available to work with individual teams that need assistance as well as teach the model to groups of leaders. We can also certify internal consultants to use the Drexler Sibbet Team Performance survey and tools. We deliver a contracted number of days for you each month. You decide who we work with, and what projects are assigned. We collaborate when and where the work takes place. Additional consultation days are available to be contracted separately. Travel and Meeting Expense are reimbursed on a cost basis. The Weekly Call – We check in with you every week to assess how we can assist you, review ongoing projects and provide coaching to you. Monthly Assessment – Every month we provide you with a full progress report, identify strategic opportunities and illustrate the value gained in the organization. We deliver executive coaching from a holistic framework. Our clients work in three major areas: increasing self-awareness, integrating themselves with the team, and applying group dynamics within the larger system. We emphasize continuous skill development throughout the program. Skills are assessed and practiced within a feedback-rich environment created and sustained by the executive. Our coaching explores the executive’s strengths – those that are known and acknowledged by the executive as well as those that are less known but seen by others. We also explore the blind development areas to improve awareness and focus. Many times executives overuse their strengths when under stress leading to results that are less than desired. Our coaching is developmental and focuses on enhancing high performance and building skills. We help our clients to become more aware of what’s possible and work with them to bring their unique talents to their business. We tailor our coaching and collaborate with the high-level manager to create a unique plan for achieving results. The coaching experience is a private, secure, and safe place for personal growth. We emphasize learning, action research, and reflective practice. You can request a detailed program by contacting us. 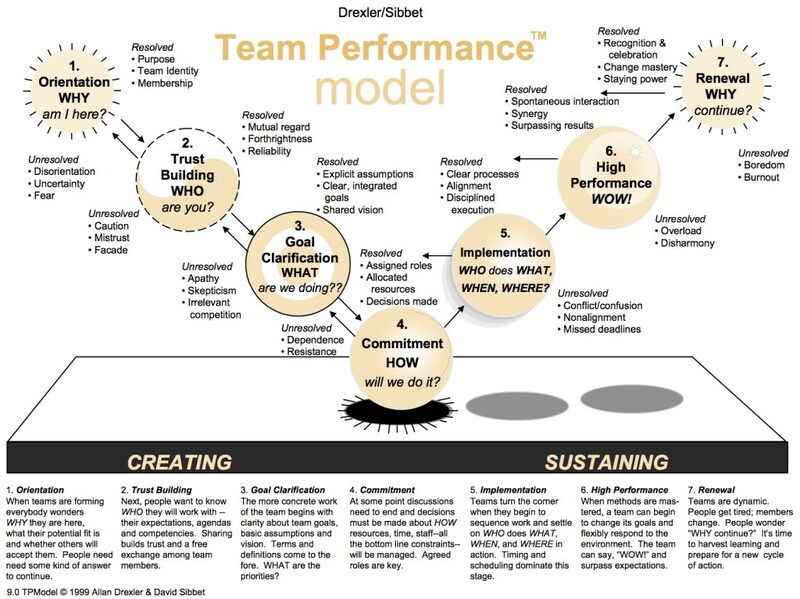 The Drexler Sibbet Team Performance Model is renowned, respected, and used by some of today’s leading organizations, including Nike, Starbucks, and Johnson and Johnson, to name a few. McNeil Consulting has trained an entire generation of team leaders how to move their teams to high performance using this great tool. Elevate your own team building knowledge and skills by contacting us to schedule a session. This program is a powerful intervention: one that helps teams increase their productivity, improve their communication, and achieve outstanding results. One of the facts of working in organizations is that things change, and very often they change rapidly. Leaders move on, team members rotate from one team to another, and new technology appears and disappears. Sometimes, innovation causes disruptions. Team members have to respond to all of this and more. It’s easy for teams to get off track, lose their focus, and produce diminishing results. Team members can get into irrelevant competition, their roles on the team can be challenged through productivity efforts, and unforeseen consequences can arise out of good intent. Every so often it’s good for a team to take stock of itself through a rigorous reexamination of its purpose, its productivity engine, and its ability to remain spontaneous. Disciplined execution depends on being clear on the overall purpose and goals of the team, building trust between and among the team members, and executing the work plan flawlessly over and over. Energy follows attention. We use a structured facilitated process to help the team members open up a rich and robust dialogue that enables them to build trust while also determining which areas of their work can improve. We combine the Drexler Sibbet Forrester Team Assessment with our unique facilitation design to help a team assess their Current Reality, create their End Result, and make the choices necessary to achieve the outcome that they want. Every team we have worked with over the past 25 years has made significant progress in productivity. Some have turned their company around, others have improved their work process. All have improved the level of trust, their ability to speak forthrightly, and their willingness to collaborate with each other. We also conduct a 3-day workshop to train team leaders and internal consultants the team performance and team building program. Collaborate: Read the Group Mind with "The Hive"
You can add a group mind collaboration tool to your ongoing management process. Using it will create an interactive dimension to your face-to-face and online meetings easily and quickly. The Hive saves money, reduces time, and increases productivity exponentially at meetings. Groups and teams can use it to conduct research on themselves in the form of brainstorms, surveys, discussions, voting, ranking, etc. The Hive was designed to brainstorm and then show the results instantly and if you want, anonymously. It allows all the voices to be acknowledged. We call it “The Hive.” It is a simple set of powerful web tools that work silently in the background of your meetings. Your meeting content remains first and foremost.. We branded “The Hive” from GroupMind software, a subsidiary of Monarch Media. For example, before going to breakouts, the participants can brainstorm ideas for each break out instantly. When the groups break out, they will have a great start based on the opinions of all the participants. And because we network the entire meeting, there is no need for those paper flip charts. We eliminate all the paper and make your session less paper dependent. Everything is saved and retrievable after the meeting. We eliminate all the typing of flip charts and the time wasted putting them into a readable format. The Hive works in about any design that you would do face-to-face or virtually. Applications: *Conducting pre-meeting surveys, *Displaying data collected (flip charts), *Prioritizing work, *Weighted voting (similar to using Avery dots), *Hosting discussions, *Storing articles and documents, *Displaying slide shows (can be followed by open commenting), *Creating action planning, *Using a matrix to display data (spreadsheets), *Confidence checks at strategic off-sites, *Change management – surfacing resistance, *Innovation circles – moving from brainstorming (divergent thinking) to prioritizing (convergent thinking). Let us know if you would like to sample The Hive. We’d be happy to provide a demonstration for you. See the slide show below to get a picture of how The Hive might help you to achieve extraordinary results. No stickies, bring your own device, no paper, all thoughts are instantly displayed. No dots, top rank, check vote, muti-scale. Quantitative and qualitative, stats, commenting, and demographics. Signed, anonymous, instant, asynchronous, and fast feedback cycles. Everyone on the same page before, during and after the meeting. Works seamlessly in the background. Integrates with face-to-face or virtual meetings.